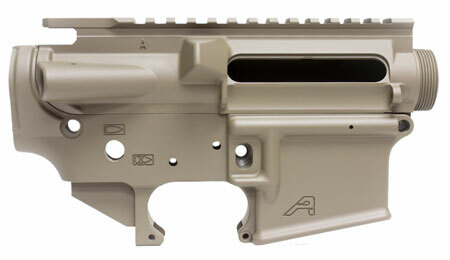 Aero Precision's AR-15 Stripped Receiver Set features a AR-15 Stripped Upper Receiver and a AR-15 Gen 2 Stripped Lower Receiver both finished in a Magpul FDE Ceakote. The upper features M4 Feedramps and .250" takedown pin holes. The lower features a rear takedown pin detent hole that is threaded for a 4-40 set screw. Both upper and lower work well with standard AR15 components and magazines, and are machined from 7075-T6 forged aluminum.